When it’s time to start making videos, you may be asking yourself, “what camera do I use?” You may worry the camera you have isn’t good enough, or that you’ll end up spending more money than you need to on a new one. 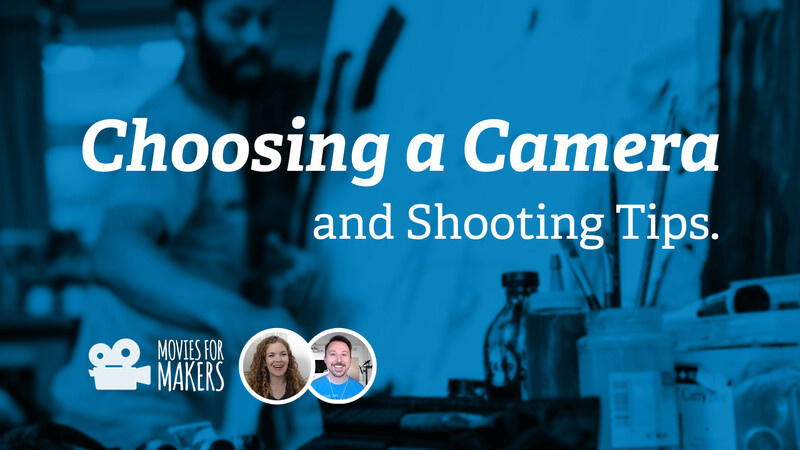 In the first episode of Movies for Makers, Zach and Jen share how to choose a camera that’s right for you, a bunch of shooting tips to help you get started making great videos yourself, and we answer live questions, too. What camera(s) do you already have available to you? What kinds of videos do you want to make? (3:38) If you have a smartphone, that’s everything you need to start. There are stability issues and audio issues with smartphones to be aware of and that you can work around. Consider buying a smartphone tripod mount adapter and a table-top tripod. In episode 3 we’ll dig into how to work with the audio issues. (7:58) If you plan to only make videos in your studio/workspace and you don’t have a smartphone (or it’s an older model), consider buying a Logitech C920 webcam. With enough light, the C920 produces a really great image. It has a built-in microphone, but it’s not the best. It really simplifies editing by recording directly onto your computer. And, it costs less than $100. (15:54) If you already have another camera that you are really comfortable with, like a DSLR, go ahead and use it. But for simplicity, we suggest streamlining your learning process and using your smartphone or a webcam to start with. “Flip it 90” and use landscape mode when you’re recording videos on your smartphone. Nearly every smartphone has 2 lenses: The forward-facing one will help you capture better quality than the “selfie” one. (31:24) Do you use a remote if you’re recording yourself with a smartphone? (37:00) How would you coach other people with tips for filming you? (41:03) Any tips for recording workshop material? (44:17) What’s an easy way to record screencasts or interviews on a PC or Mac? (48:13) How to increase the quality of recordings over the internet? Episode #1: Choosing a Camera and Filming Tips // hey, this is the post you’re on!